Irritants. A rash in just one spot is usually caused by skin contact with an irritant. Plants. Many plants cause skin reactions. Sap from evergreens can cause a red area. Pollen. Playing in the grass can cause a pink rash on exposed skin. Pet Saliva. Some people get a rash where a dog or cat has licked them. Food. Some children get a rash if a food is rubbed on the skin. An example could be a fresh fruit. Some babies get hives around the mouth from drooling while eating a new food. Chemicals. Many of the products used in the home can be irritating to the skin. Insect Bite. Local redness and swelling is a reaction to the insect's saliva. Can be very large without being an allergy. Kids often get mosquito bites without anyone noticing it. Bee Sting. Local redness and swelling is a reaction to the bee's venom. Can be very large without being an allergy. Cellulitis. This is a bacterial infection of the skin. The main symptom is a red area that keeps spreading. Starts from a break in the skin (such as a scratched insect bite). The red area is painful to the touch. Other Common Causes. Look at the "See Other Care Guide" section. 8 rashes that you may be able to recognize are listed there. If you suspect one of them, go there. If not, use this guide. Localized means the rash occurs on one small part of the body. Usually, the rash is just on one side of the body. An example is a rash on 1 foot. Exceptions: athlete's foot can occur on both feet. Insect bites can be scattered. Widespread means the rash occurs on larger areas. Examples are both legs or the entire back. Widespread can also be on most of the body surface. Widespread rashes always occur on matching (both) sides of the body. Many viral rashes are on the chest, stomach and back. The cause of a widespread rash usually goes through the blood stream. Examples are rashes caused by viruses, bacteria, toxins, and food or drug allergies. The cause of a localized rash usually is just from contact with the skin. Examples are rashes caused by chemicals, allergens, insect bites, ringworm fungus, bacteria or irritants. This is why it's important to make this distinction. Poison ivy or oak: exposed areas, such as the hands. Blisters without a clear cause. Exception: Poison Ivy. Most new localized rashes are due to skin contact with an irritating substance. Try to find the cause. Consider irritants like a plant (such as evergreens or weeds). Also, chemicals (such as solvents or insecticides). Irritants also can include fiberglass or detergents. A new cosmetic or new jewelry (such as nickel) may also be the cause. A pet may carry the irritant, as with poison ivy or oak. Also, your child could react directly to pet saliva. 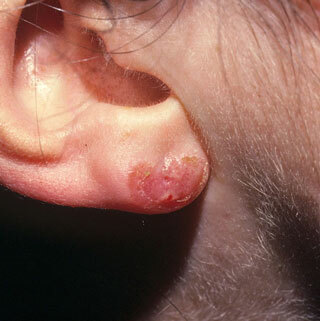 Review the list of causes for contact dermatitis. Wash the red area once with soap to remove any remaining irritants. Then, do not use soaps on it. Reason: Soaps can slow healing. Cleanse the area when needed with warm water. Use a cold wet washcloth or soak in cold water for 20 minutes. Do this every 3 to 4 hours as needed. This will help with itching or pain. If the itch is more than mild, use 1% hydrocortisone cream (such as Cortaid). Put it on the rash. Use it 3 times per day. Exception: Do not use for suspected ringworm. Children with localized rashes do not need to miss any child care or school. Most of these rashes go away in 2 to 3 days. This shows a rash that was caused from a nickel allergy. The allergic rash is from the nickel (metal) in the earring. It is red, crusty and moist. There is redness and puffiness of both cheeks; this is the first sign of Fifth's Disease. This is a picture of ringworm. The area is round and pink. It has a raised, rough scaly border. The ring slowly grows in size. It is often slightly itchy. This is caused by a fungus, not a worm. It can be passed from person to person. If you notice a rash like this, contact your doctor for treatment. This shows impetigo on the face. 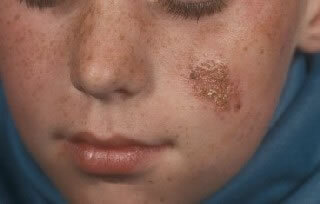 Impetigo is a skin infection caused by bacteria. The infection causes a red sores which leak fluid. This area will then dry and become crusty as it heals. This photo shows a red diaper rash in the area under the diaper. Any diaper rash that lasts longer than a couple days can become infected with yeast. Note the red spots outside the main area of redness. If a yeast infection is suspected, clotrimazole cream (such as Lotrimin; over-the-counter) should be applied 4 times per day. This shows a rash that was caused from the skin touching the snap on the jeans. This person is allergic to the nickel in the snap. The area is red and crusty. This shows a rash that was caused from the skin touching the snap on the jeans. This person is allergic to the nickel in the snap. The area is raised and crusty.